On my forays into San Antonio over the years I have often walked past this incongruous mansion, overlooking the port entrance and completely unlike all the surrounding ‘edificios’. Villa Mercedes is grand, colonial and set back in its own grounds. Often looking worse for wear as it changed hands. No longer. I was greeted by a shining, shimmering grand old man, like an old soldier on parade with his buttons and medals gleaming. It’s unusual in Spain to step up into grounds. The compound walls of Villa Mercedes are high and proud. A staffer greets you on the street and ushers you up into a very classy garden with neat surroundings but not starchy, as eccentric Gaudiesque touches grab the eye here and there. A fountain here, an erratic pavement there. Jazz themes abound. It’s a smart and distinguished vibe to take on the island of electronica and halls back to the first musical invasion here in the 1950s as jazz musicians and painters escaped to the sun seeking liberty and inspiration. Villa Mercedes is not merely attempting a touch of class in San Antonio it is achieving it. I think it is admirable. The whole place oozes quiet confidence and dare I say, even sophistication. Our host Fabio was a man on a mission. As usual, I left the choices up to the house. I wasn’t disappointed. A quick croqueta, good home-made aioli and a cocktail to settle in and the starters arrived with a passion. First up was a solo egg lightly fried into a crusty basket with Jamon Iberico, the most sophisticated fried egg and chips I have ever had. Presentation was strong. Looked good and tasted great. Barely a pause before a couple of monster langoustines appeared and stole the limelight. Those divas, in turn, were outshone by the best bit of pulpo (octopus to you and me) I’ve had in a long time. Chef just dropping exactly the right amount of sauces in a nouvelle manner to go with everything perfectly. Barely a gut was busted before a nebulous beef carpaccio with lime, hint of basil with drops of emulsified Taleggio cheese barged in and took over the table. Again, up there with one of the best carpaccios I have had not just in San Antonio but Ibiza herself. Hats off Villa Mercedes. A perfect amount of rare steak in strips with a spiced jus and Ibicenco chimichurri came as a main but again, the portions were so well measured and correctly delivered that it didn’t feel like hard work. A medley of all the desserts on offer on a taster plate rounded off a celebration of what Villa Mercedes is confidently trying to bring forth. 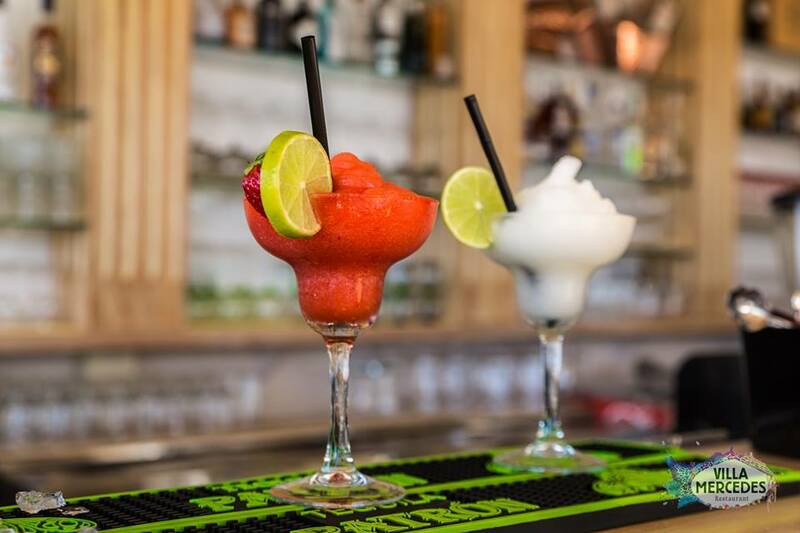 The taste of Ibiza with a touch of heritage and class. The prices are not cheap, however, they are definitely in keeping with what you get for your money. I’m so happy San Antonio has somewhere like Villa Mercedes. Along with Sa Capella, I would go as far as to say one of the best restaurants for both food and surroundings that San Antonio can offer. Congratulations to all concerned! I doff my imaginary hat to you all. 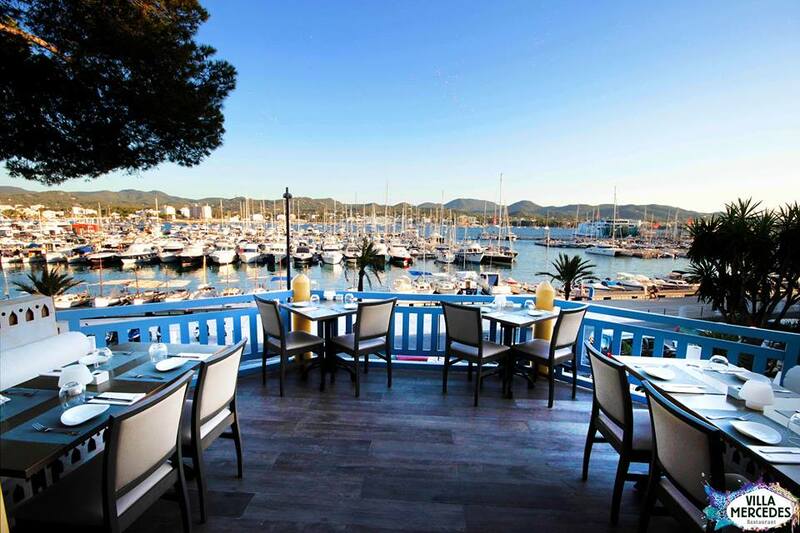 Location: Passeig de la Mar, 14, The Port of San Antonio, 07820, Ibiza. Open for: Lunch & dinner every evening all summer from 1pm – midnight. Price range: Mid-range. Expect to pay around €40-60 for a two course a la carte dinner & wine. 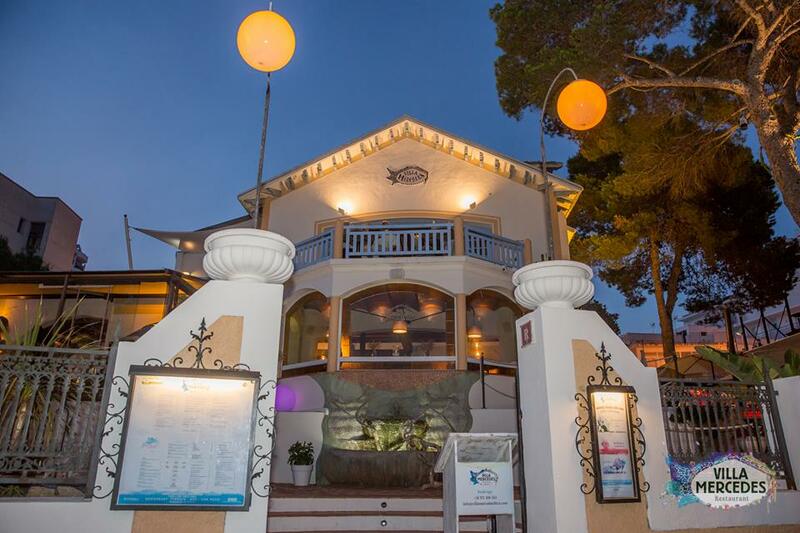 Parking: Free car-park opposite Ibiza Rocks bar is closest or grab a blue bay if you’re dining after 7pm. 2hrs maximum parking for €2 which takes you up to 9pm during summer months. After that it’s free. Bookings: Not always necessary but recommended. Top tip: Check out their live performance nights, when luminaries such as Paco Fernandez regularly grace the premises with live Jazz, Flamenco and more. Planning a trip to Ibiza? Interested in great value Ibiza villas for rent in and around San Antonio, Playa D’en Bossa or Ibiza Town? 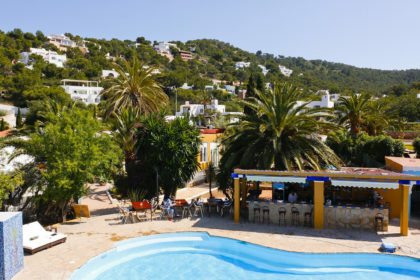 Check out our lush & yet affordable Ibiza villa collection, with short-term, mid-week and weekend breaks welcome. Like us on Facebook or follow us on Twitter / Instagram to be the first to hear about our fantastic special offers.